Throw on top of that smartphone manufacturers capturing more and more of the market with more and more sophisticated cameras in their phones. When the first big-screen smartphones entered the market in 2007, the camera industry was powering along. 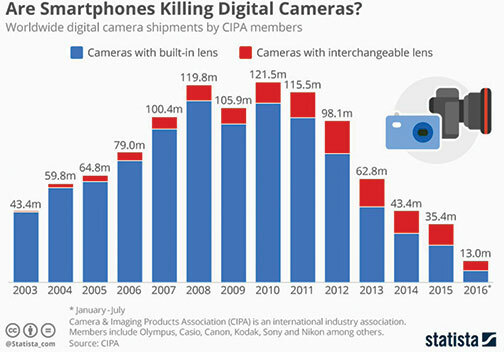 At the end of 2008, camera makers shipped almost 120 million digital cameras. Back then smartphone cameras sucked and there was no Instagram, Flickr, Snapchat or beBee. In 2015, camera makers shipped only slightly over 35 million digital cameras (see chart), primarily because of the dramatic improvement in smartphone cameras and the fact that every single person on the planet in a developed country has a smartphone. An interesting observation is that digital camera sales peaked in 2010 with more than 120 million units sold. That was the same year Instagram was launched, and not so coincidentally, camera sales have been on a steady decline since. So, with 2016 looking like the worst year ever for digital camera sales, what are photo retailers supposed to do? Give up? I say not. It is a well-known business principle that in a declining marketing the strongest players not only survive but get stronger. Here are the 12 things all photo retailers should be doing in 2017 to cut costs, survive and thrive. 1. Pair Down Your Product Lines: Poor cash flow is a killer for any retailer. If you are carrying too many bags, tripods, lighting, accessories and, yes, even cameras, now is the time to reduce the number of product lines. Carrying product lines consumes capital, labor and space. In many cases, we have a long history with vendors and even a personal relationship with salespeople and executives, so we carry their stuff. Your kindness to them is hurting you and your company. If you are unsure of what to cut, ask your staff and systematically go through each product category and only carry what sells. Don’t fear losing a customer because you don’t have some bag in a color. Having that inventory line would ultimately cost so much the sale is a loser anyway. A good technique here is to go to the vendor you want to keep and ask them if they will give you anything extra to remain your vendor of choice. Do that before you nix their competitor from your store, of course. Hopefully you don’t have enough for a tent but putting the stuff out, neatly, dust free, with red tags and in a prominent place in your store is a great idea. You can turn deadwood into a positive by having customers feel like they got a steal while you’re freeing up some capital. 3. Return to Vendor: Address is known. You’ve seen the chart above. Their sales are plummeting and their jobs are on the line. If you are stuck with expensive inventory, it’s time to return it. The best method and least likely to cause major relationship damage is to offer an exchange—even if you must buy $2 for every $1 you return. You may need to hold out by not ordering anything new to achieve this goal, but you can do it. It’s time to get tough and ignore any intimidation factors they might try. 4. Vendors Still Have Dough: Even if your sales are down, you should still press hard for vendor support. They are more desperate than ever for sales, and if you can present a good business proposal they will support you. In fact, they have less outlets to spend their money on so the loudest customer and best plan will get more support than ever. 5. Focus on Quality Customers: Yes, not all customers are created equally. It’s time to understand who your best customers are and focus on satisfying them. The days of trying to satisfy all customers are gone, because it’s too costly. If you have a customer who constantly returns things, haggles over price or orders items you never have in stock, it’s time to cut bait and ever so gently ease them out of your store. These customers hurt morale, consume resources and cost you money. Let them go buy from your competition or Amazon. 6. Focus on Customer Service: You must set the example for fanatically good customer service. It is one of the things brick-and-mortar stores can still do better than online—if you are serious about it. Turning a complaint around into a positive experience bonds a customer to you for life. They will talk about that to everyone. Conversely, we all know what unhappy customers can do to your online reputation with a negative review. Make sure you have a written policy about customer service. It is always good when the store owner or manager responds directly to a customer service problem. And copy your staff on the response. It sets an example and builds morale. It’s time to make sure you have only the best servicing your customers and have only employees doing lots of work and multiple tasks. As an example, in my store, I had three different employees for receptionist, coffee bar barista and credit card address checker. When times got tough, those three employees turned into a single good one. 8. Double Down on Education: In these slower times, you should increase your class offerings. Essentially every single successful photo retailer has a quality education program. Make sure your class space looks great (even if it’s small), your topics are of varied interests and levels, and your instructors are informative and well liked. As I’ve said before, a well-functioning and continuous education program is the emotional experience that deeply connects a customer to your store. It turns customers into loyalists who will come back to your store regularly and they will tell others about their experience. It’s something that you can offer that the online and NYC stores can’t do for your customer. 9. Social Media Mania: If you aren’t using social media to build your brand and business every day, you are falling behind one day at a time. And social media is not something you do—it’s a lifestyle. You know in your heart you need to be doing more and more social media. So it’s time to take one of your photography-knowledgeable people and have them do it in addition to their regular job. Social media is the second most cost-effective way to advertise for your business. For $20 or less you can run an effective Facebook campaign that will deliver customers to your store and classroom. 10. E-mail Every Week: E-mail is still the number one most cost-effective way to get customers into your store. You should have a coordinated e-mail program where you e-mail customers once per week on new products and once more about events and classes. Keep your e-mails interesting, colorful, easy to read. Avoid heavy direct selling as that gets people to unsubscribe or stop opening e-mails. 11. Outsourcing Is the Way to Go: Social media, telephone, accounting, HR, whatever you can look to outsource, go for it. With the cost of labor and health care ever rising, some jobs functions can be very cost effectively outsourced. I hired a social media company to do most of my company’s postings for $1,000 per month. You can outsource all your accounting for a similar amount. I got rid of my regular telephone system and outsourced that for a cloud-based solution for a fraction of the cost of a regular PBX. 12. How Badly Do You Want It?! That’s my personal slogan. If you run your store with desperation and you want to survive and thrive badly enough, you can make it happen. It requires work, imagination and dedication. But ultimately you are the only one who can lead your business to success. Begin the new year by making a timeline with the points in this column and when you will achieve them. Hold a meeting with your staff and have them help drive the process. I know times are tough, but you just can’t give in or even allow yourself to wear down. Now is the time for photo retailers to dig in, work hard and drive more efficiency into your businesses. I hope you can use the tips I have given you here to make it happen for you. My New Year wish for all photo retailers: May your inventory turn frequently, your employees be hardworking and cause you little stress, and your bank account be full with profits. Wishing you all a super successful 2017.